Some amount of work has gone into making 'Youngistaan' somewhat believable as a film about a young man who is propelled into the nation’s highest political seat. Some amount of work has gone into making ‘Youngistaan’. Some amount of work has gone into making ‘Youngistaan’ somewhat believable as a film about a young man who is propelled into the nation’s highest political seat, not because he wants to but because he is not given an option. Sounds familiar? Many familiar events and political figures pop up, lightly fictionalised, in this story, which gives us a young leader with ideas on harnessing youth power. And how he goes from being a total greenhorn into a smart ‘neta’ who learns how to catch the pulse of a tumultuous, pulsating, on-the- verge-of-polls-India. The fact that the Lok Sabha elections are around the corner in real India is smart timing. And attempts have been made to include some hot button issues and images: watch Abhimanyu Kaul (Jackky Bhagnani), hitting the campaign trail, having a frugal meal with a group of village women. Or a defence minister being caught by the CBI for having taken ‘kickbacks’ in a deal. Or getting potential thorns out of the way by giving them posts which are more ceremonial than anything else. And parties that are called ‘ABKP’ and ‘UDA’. 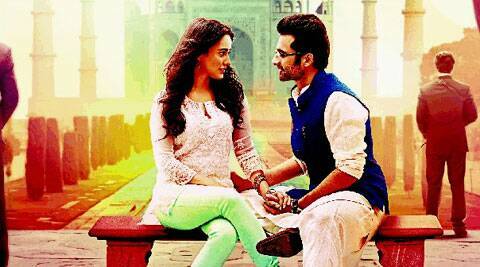 All of these little threads and a few other intrigues make ‘Youngistaan’ an interesting watch, but only up to a point. After a while, the pace slackens, and the focus gets diluted. The fact that a 28 year-old-Prime Minister `lives in’ with his girl-friend (Neha Sharma) whom he has no intention of marrying till both are good and ready, has freshness to begin with. A few amusing episodes are woven in when she flies off the handle for various reasons and the poor fellow has to come running to hold her hand, abandoning the running of the nation. But instead of building on it, and opening meaningful dialogue on thorny issues (are ‘live-in relationships’ bad things; how the personal becomes public, and so on), it all becomes improbable and a tad costume-drama amateurish. The insertion of the romantic-funny bits have obviously been made to keep the self-same ‘young’ that the film targets in their seats. Serious stuff like elections and polls ( there is mention of the ‘Aadhar card’, and ‘badlaav’, and a star TV anchor is called ‘Mr Parnab’ or some such) is presumably too heavy. The film, despite its efforts, becomes muddled, and dull. The one I enjoyed watching most was the late Farooque Shaikh, who plays the young politician’s mentor and friend. Shaikh has a large role, and he plays it with his customary humour and grace, lending much-needed gravitas to this film. This ‘youngistaan’ will always remember him with love and affection.